← He Really Shouldn’t Have. From the delights of the Delta Business Lounge in Atlanta, we board a plane to fly almost directly south for ten hours and find ourselves in the beautiful city of Buenos Aires where we will be spending the next two weeks. 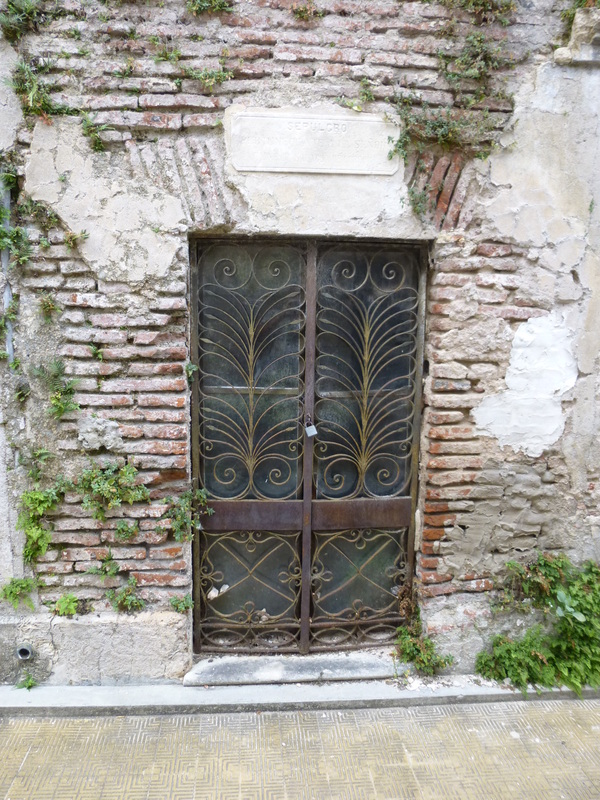 We have rented an apartment on line, persuaded by the photos and the friendly emails from the owner. We are not disappointed by the apartment or the owner who turns out to be a delightfully charming gay man with receding hair, tight jeans, twinkling eyes and a disarming smile. Three out of four works for me. We arrive at nine in the morning, with a long day ahead of us. The possibility of spending our first day in a cemetery seems an odd choice but an obvious one. Not only is there a famous one conveniently nearby but it will provide a final resting place if the jet lag and loss of sleep gets the better of us. 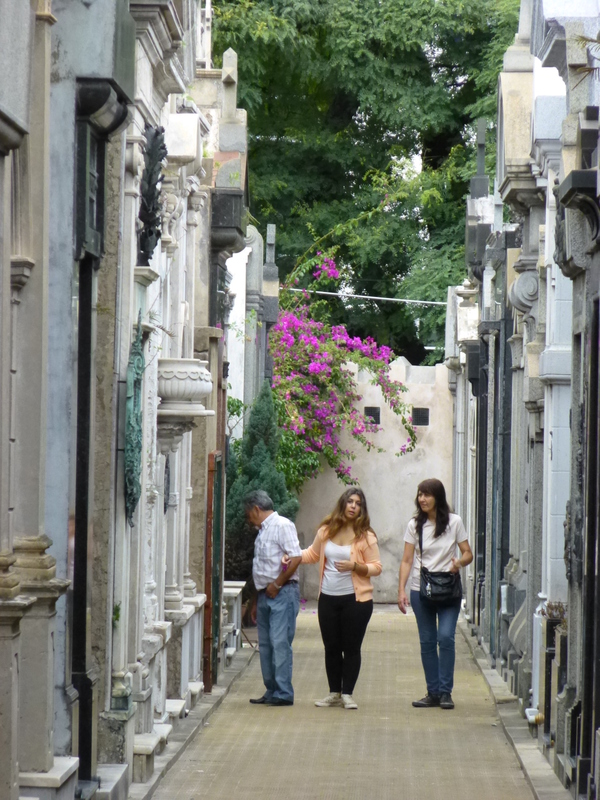 We are just two blocks from the Recoleta Cemetery, a tourist destination mentioned in every guide book. 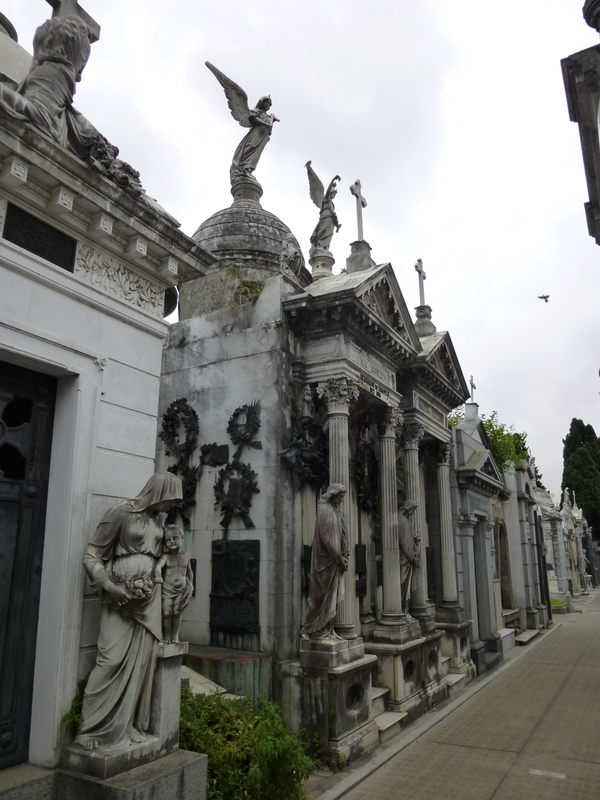 Argentinians appear to be obsessed with death and it is hard to argue the point when standing outside the neo classical gates to this cemetery. Most westerners are happy if their final resting place has a nice bit of grass and a small engraved headstone. They are ecstatic if there are some nicely cut flowers in a vase, although that usually only lasts for a few weeks until their nearest and dearest forget about them. 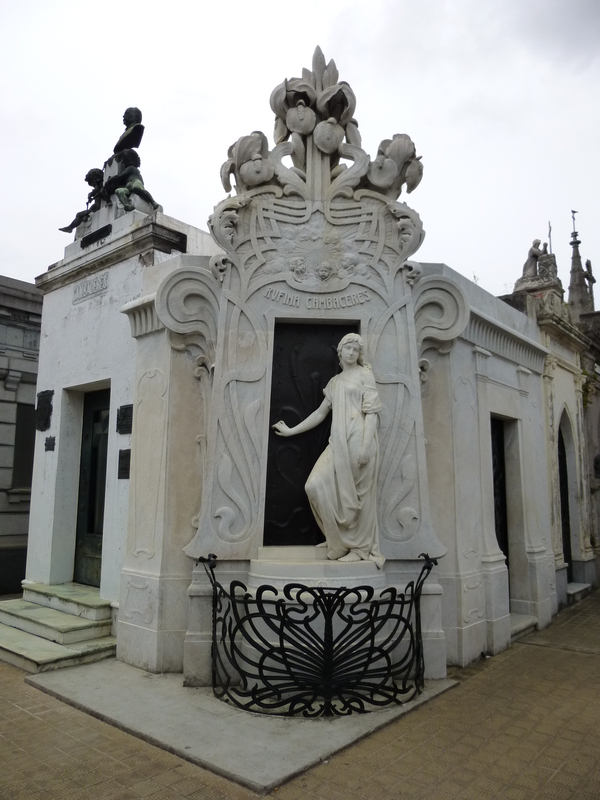 Argentinians on the other hand require to be put to rest in a mausoleum the size of a small building, adorned with statuary, plaques and a lot of marble. Their cemeteries are like small cities, with narrow streets lined with these ornate tombs, each one trying to outdo the next. 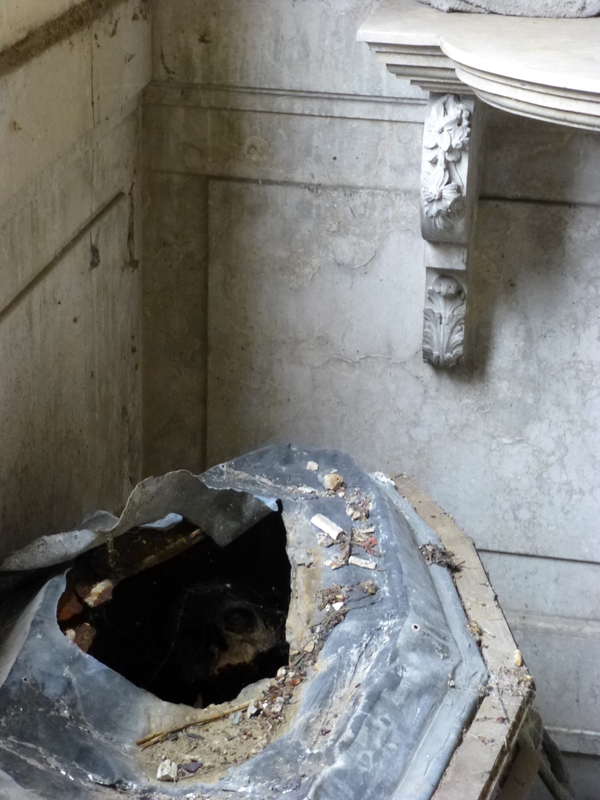 Overcrowding is not an issue for the dead and each mausoleum butts directly up to the neighbour, often touching on three sides. No nicely cared for lawns here, in fact no green what so ever, just obscene amounts of money. and yes that is the skull! 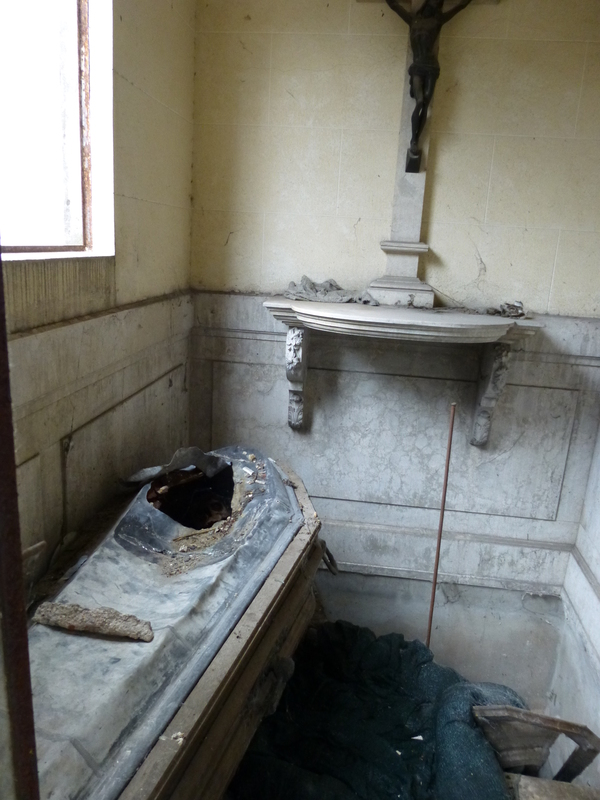 But there is a reason, for here lies the body of Eva Peron. 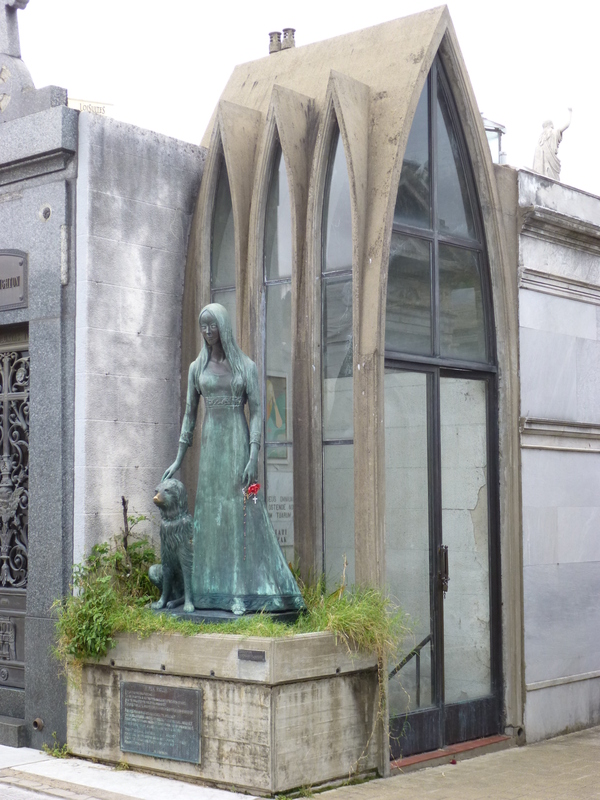 There are over 4700 tombs in the Recoleta Cemetery, but the remains of this one person has made this the top tourist attraction of the city, thus proving once more the power of Broadway, and of course Madge. Madonna did for Eva Peron what Bette Midler did for wheelchairs and fish tails. They have all become gay icons. It is for this reason that we are following in the footsteps of millions of tourists before us and thousands of gay men. 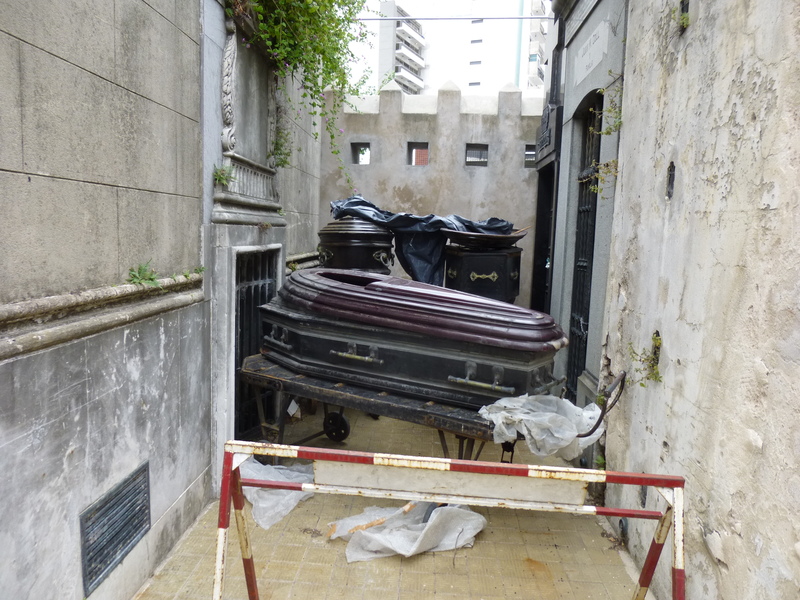 We are looking for Evita’s final resting place. 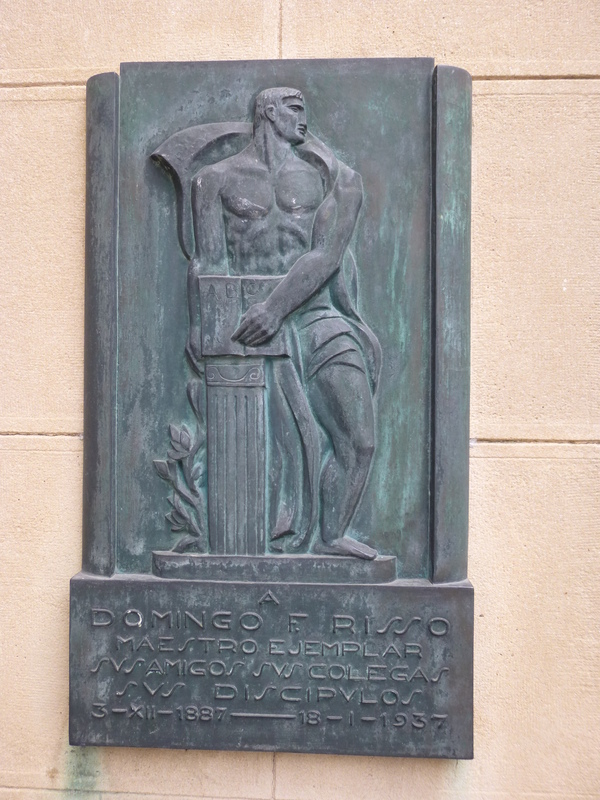 This entry was posted in Buenos Aires, Eva Peron. Bookmark the permalink. Ok, on the lighter side , which of the three attributes of your landlord were the important ones..:-D? 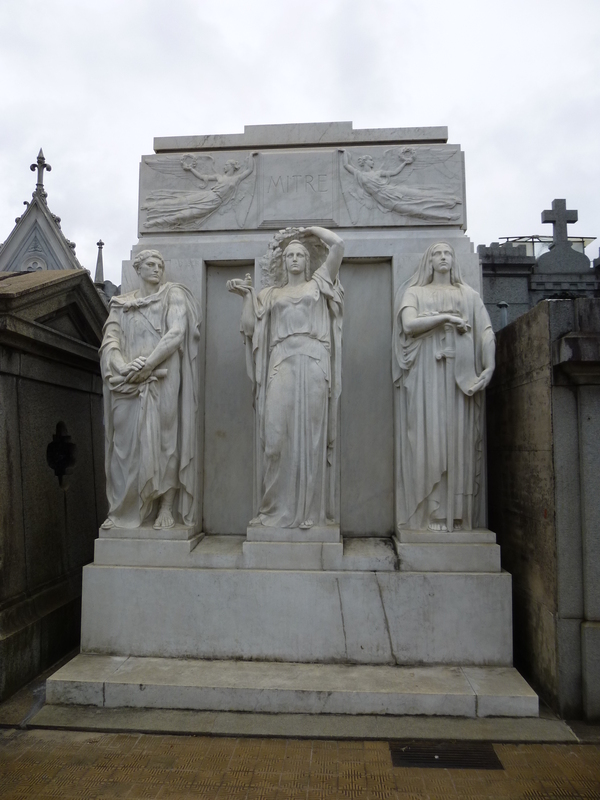 on the “educate me” side of the blog.. Are these burial structures for one family–one person–and yes, I did read about the 3somes comment. They must have an obscene amount of land to do that. That, I assume, is one of many cemeteries. Is B.A. a large gay community area? Let’s just say I am not a fan of receding hairlines. This is indeed one of many cemeteries – but do they take up any more land than huge expanses of lawn in the US? 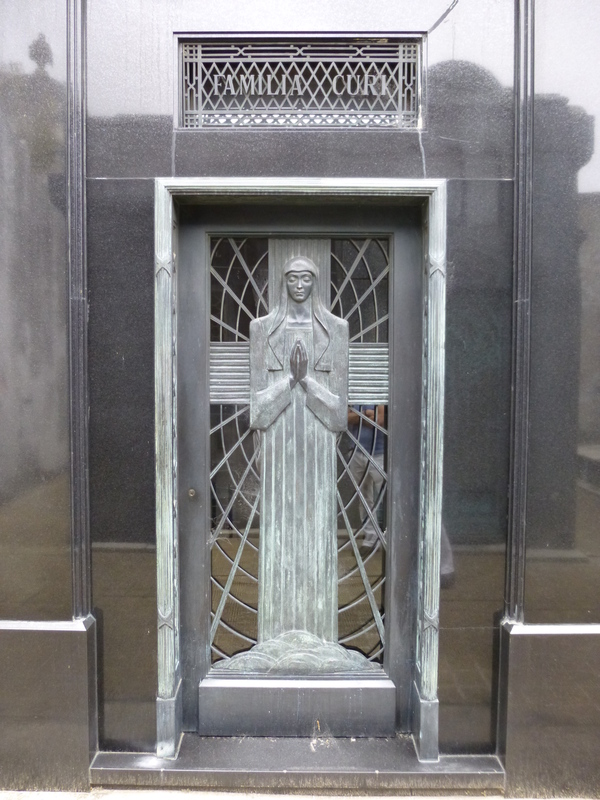 The mausoleums are usually reserved for families and there is a plaque for each person buried there. However some just have one plaque. And yes BA has a large gay community.. Gay marriage was legalized in 2010 while the US is still thinking about it in 2013. Buenos Aires was the first city in South America to recognize gay marriage. And transgender people are allowed to legally change their names. It puts the US to shame! I would have to agree. Some changes come slowly, and this one that is shamefully slow. Creepy. We’re a long time dead. Get back out among the living. As for receding hairlines, like you have to worry! Oh great – you are going to be writing about Buenos Aries. I was there in 2004 and thought it one of the most beautiful cities I have ever set foot in. I went to that cemetery and it was like a city within a city. Didn’t find it creepy – see Baz above. Found it intriguing. Look out for the amazing antique and junk shops selling old silver objects and art nouveau lamps. There was a very high level of artistic skills in silver and glass in 1920’s Buenos Aries. We just spent the day at the San Telmo Sunday Antique market – fabulous. We had an Art Deco shop ourselves many years ago so we loved it. Enjoyed your first day. At the cemetery I felt a little sad and I laughed. Where is Eva? What tease. Can’t wait for the next day. Gordon I am sorry you got all wet!